For other uses, see Aragon (disambiguation). Aragon (/ˈærəɡɒn/ or /ˈærəɡən/, Spanish and Aragonese: Aragón [aɾaˈɣon], Catalan: Aragó [əɾəˈɣo]) is an autonomous community in Spain, coextensive with the medieval Kingdom of Aragon. Located in northeastern Spain, the Aragonese autonomous community comprises three provinces (from north to south): Huesca, Zaragoza, and Teruel. 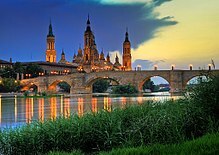 Its capital is Zaragoza (also called Saragossa in English). The current Statute of Autonomy declares Aragon a historic nationality of Spain. Unofficial Anthem: "Canto a la libertad"
Covering an area of 47720 km2 (18420 sq mi), the region's terrain ranges diversely from permanent glaciers to verdant valleys, rich pasture lands and orchards, through to the arid steppe plains of the central lowlands. Aragon is home to many rivers—most notably, the river Ebro, Spain's largest river in volume, which runs west-east across the entire region through the province of Zaragoza. It is also home to the highest mountains of the Pyrenees. As of January 2016[update], the population of Aragon was 7006130856300000000♠1308563, with over half of it living in its capital city, Zaragoza. During the same year, the economy of Aragon generates a GDP of 7004346870000000000♠€34687 million, which represents 3.1% of Spain's national GDP, and is currently 6th in per capita production behind Madrid, Basque Country, Navarre, Catalonia and La Rioja. In addition to its three provinces, Aragon is subdivided into 33 comarcas or counties. All comarcas of Aragon have a rich geopolitical and cultural history from its pre-Roman, Celtic and Roman days, and four centuries of Islamic period as Marca Superior of Al-Andalus or kingdom (or taifa) of Saraqusta, and as lands that once belonged to the Frankish Marca Hispanica, counties that later formed the Kingdom of Aragon and eventually the Crown of Aragon. The current coat of arms of Aragon is composed of the four barracks and is attested for the first time in 1499, consolidating since the Early Modern Ages to take root decisively in the 19th century and be approved, according to precept, by the Real Academia de la Historia in 1921. The first quartering appears at the end of the 15th century and commemorates, according to traditional interpretation, the legendary kingdom of Sobrarbe; in the second quarter there is the so-called "Cross of Íñigo Arista", innovation of Peter IV of Aragon (from an anachronistic interpretation of the cross that symbolized the religion of the Asturian, Navarrese and Aragonese Christian kings), who took it as shields of the ancient kings of Aragon, although historically there were no heraldic emblems in the peninsula (or "signal shields", as it was said in the Middle Ages) before the union dynastic of 1137 of the House of Aragon with the House of Barcelona; in the third quartering appears the Saint George's Cross escutcheoned of four heads of Moors (the call "Cross of Alcoraz"), that is witnessed for the first time in a seal of 1281 of Peter III of Aragon and would remember, according to tradition arising from the 14th century, the battle in which Peter I of Aragon and Pamplona and the future Alfonso I of Aragon took Huesca and was considered in the Early modern Ages one of the proprietary emblems of the kingdom of Aragon; and in the fourth is the emblem of the so-called "bars of Aragon" or Royal Sign of Aragon, the oldest of the heraldic emblems that are part of the current coat of arms, dated in the second half of the 12th century. This emblem of gules and gold was used in seals, banners, shields and standards indistinctly, not being but a familiar emblem that later denoted the authority as King of Aragon until, with the birth of Modern State, began to be a territorial symbol. The current flag was approved in 1984, with the provisions of Article 3 of the Statute of Autonomy of Aragon, the flag is the traditional of the four horizontal red bars on a yellow background with the coat of arms of Aragon shifted towards the flagpole. The bars of Aragon, common historic element of the current four autonomous communities that once were integrated into the Crown of Aragon, present in the third quartering of the coat of arms of Spain. The anthem of Aragon (himno de Aragón) was regulated in 1989 with music by the Aragonese composer Antón García Abril that combines the old Aragonese musical tradition with popular musical elements within a modern conception. The lyrics were elaborated by the Aragonese poets Ildefonso Manuel Gil, Ángel Guinda, Rosendo Tello and Manuel Vilas and highlights within its poetic framework, values such as freedom, justice, reason, truth, open land ... that historically represent the expression of Aragon as a people. The Day of Aragon is celebrated on April 23 and commemorates Saint George, patron of the Kingdom of Aragon since the 15th century. It appears in Article 3 of the Statute of Autonomy of Aragon since 1984. Institutional acts such as the delivery of the Aragon Awards by the Government of Aragon or the composition of a flag of Aragon of flowers, with the collaboration of citizens, in the Plaza de Aragón square of Zaragoza. The area of Aragon is 7010477200000000000♠47720 km2 of which 7010156360000000000♠15636 km2 belong to the province of Huesca, 7010172750000000000♠17275 km2 to the province of Zaragoza and 7010148100000000000♠14810 km2 to the province of Teruel. The total represents a 9.43% of the surface of Spain, being thus the fourth autonomous community in size behind Castile and León, Andalusia, and Castile-La Mancha. It is located in the northeast of the Iberian Peninsula, at a latitude between 39º and 43º'N in the temperate zone of the Earth. Its boundaries and borders are in the north with France, the regions of (Nouvelle Aquitaine and Occitanie), in the west with the autonomous communities of Castile-La Mancha (provinces of Guadalajara and Cuenca), Castile and León (province of Soria), La Rioja and Navarre and in the east with the autonomous communities of Catalonia (provinces of Lérida and Tarragona) and Valencian Community (provinces of Castellón and Valencia). The orography of the community has as central axis the Ebro valley (with heights between 150 and 300 meters approx.) which transits between two foothills, the Pyrenean and the Ibérico, preambles of two great mountain formations, the Pyrenees to the north and the Sistema Ibérico to the south; the Community has the highest peaks of both mountain ranges, the Aneto and the Moncayo respectively. Aneto peak is the highest point of all Pyrenees. It is located in the Posets-Maladeta Natural Park. The Aragonese Pyrenees is located in the north of the province of Huesca and is arranged longitudinally in three large units: High Pyrenees, Intrapirenaic Depression and Outer Ranges. The Aragonese High Pyrenees contains the maximum heights of all the Pyrenees mountainous chain. The High Pyrenees is formed in turn by the axial Pyrenees and the Inland Ranges. In the axial Pyrenees are the oldest materials: granites, quartzites, slates and limestones and the highest peaks like: the Aneto (7003340400000000000♠3404 m), Maladeta (7003330900000000000♠3309 m) and the Perdiguero (7003322100000000000♠3221 m). The inner Pre-Pyrenees, composed of more modern rocks (limestones) also has large mountains such as Monte Perdido (7003335500000000000♠3355 m), Collarada (7003288600000000000♠2886 m) and Tendeñera (7003285300000000000♠2853 m). La Besurta trail in the Benasque Pyrenean Valley. Abbey of San Pedro de Siresa, monastic, political and cultural center of the ancient County of Aragon, where Alfonso I was educated. It is located in the Hecho Pyrenean Valley. Mallos de Riglos conglomerate rock formations, in Las Peñas de Riglos. The intrapirenaic depression is a broad perpendicular corridor. Its best represented section is the Canal de Berdún. The southern limit of the Depression corresponds to the energetic reliefs of San Juan de la Peña (7003155200000000000♠1552 m) and Oroel Rock (7003176900000000000♠1769 m), modeled on conglomerates of the Campodarbe Formation. The pre-Pyrenean outer ranges are in the Huescan foothills and constitute the southernmost unit of the Pyrenees; formed by predominantly calcareous materials, reach heights between 7003150000000000000♠1500 and 7003200000000000000♠2000 meters. The Sierra de Guara, one of the most important mountain ranges of the Spanish Pre-Pyrenees, stands out; its summit, the Guara Peak, reaches 7003207700000000000♠2077 metres. The Mallos de Riglos, near the town of Ayerbe, stand out for their beauty. It extends a wide plain, after passing the foothills, corresponding to the Depression of the Ebro. To the southwest is the Sierra de Alcubierre ranges (7002811000000000000♠811 m) one of the typical limestone plateaus of the Depression. The depression of the Ebro is a tectonic pit filled with sedimentary materials, accumulated in the Tertiary age in horizontal series. In the center, fine materials such as clays, plasters and limestones were deposited. To the south of the Ebro have been the limestone plateaus of Borja and of Zaragoza. Moncayo Massif seen from Tarazona. Moncayo, with its height of 7003231430000000000♠2314.3 m, is the maximum summit of the Sistema Ibérico mountainous chain. The Aragonese Sistema Ibérico is divided between the provinces of Zaragoza and Teruel. It is a set of hills without a clear structural unit, which can be divided into two zones: Sistema Ibérico del Jalón and Sistema Ibérico turolense. In the first, the Moncayo stands out with 7003231400000000000♠2314 m, formed by Paleozoic quartzites and slates, partly covered by Mesozoic limestones; to the southeast of the Moncayo the Sistema Ibérico descends of height. The second is formed by elevated terrain (from 7003100000000000000♠1000 to 7003200000000000000♠2000 m in general), but flattened and massive. To the southwest of the depression the summits of the Sierra de Albarracín range are reached above 7003180000000000000♠1800 m, southeast the 7003200000000000000♠2000 m are reached in the Sierra de Javalambre range and finally we arrive at the Sierra de Gúdar range (7003202400000000000♠2024 m) transition to Maestrazgo. Although the climate of Aragon can be considered, in general, as a continental Mediterranean climate, its irregular orography creates several climates or microclimates throughout the entire community. From the High mountain climate of the central Pyrenees to the north, with perpetual ice (glaciers), to the steppe or semi-desert zones, such as the Monegros, passing through the intense Continental climate of the Teruel-Daroca area. The aridity, product of a situation of bucket fitted between the Pyrenean mountain ranges of the north and the Sistema Ibérico to the south, that makes the rains discharge in these high foothills and creates a central situation of absence of precipitations and contrasts of temperatures, with very prolonged extreme seasons with very cold winters and hot summers, and of transition—spring and autumn—short and variable, all inherent to the continental climate specific to the Iberian Peninsula. Monegros site, of arid climate and extreme temperatures. The irregularity of the rains due to the component Mediterranean climate, with alternating dry and wet years. The air currents that are encased in the middle Ebro Valley from northwest to southeast (cierzo), which stands out for its intensity and frequency, and from southeast to northwest (heat index). Average temperatures are very dependent on height. In the Ebro Valley the winters are relatively moderate, although the frosts are very common and the thermal sensation can decrease a lot with the cierzo, temperatures in summer can reach near the 40 °C. In mountain areas winters are long and rigorous, average temperatures can be up to 10 °C lower than in the valley. The two most important winds of Aragon are the cierzo of the north and the heat index of levant. The first is a very cold and dry wind that crosses the Ebro Valley from northwest to southeast and that can present great strength and speed. The second is a warm wind, more irregular and smooth coming from the south-east. The vegetation follows the oscillations of relief and climate. There is a great variety, be it wild vegetation or human crops. In the high areas you can find forests (pines, firs, beech trees, oaks), bushes and meadows, while the areas of Ebro Valley evergreen oak and juniper are the most numerous trees, apart from the lands exploited for agricultural use. The Ebro river on its way through Zaragoza. Most Aragonese rivers are tributaries of the Ebro, which is the strongest in Spain and divides the community in two. Of the tributaries of the left bank of the river, that is to say the rivers originating in the Pyrenees, the Aragón river stands out, which was born in Huesca but ends at the community of Navarre, the Gállego and the Cinca, which joins the Segre just before emptying into the Ebro at the height of Mequinenza. On the right bank, the Jalón, Huerva and Guadalope stand out. In the stream bed of the Ebro river, near the limit with Catalonia, the Mequinenza Reservoir, of 7003153000000000000♠1530 hm3 and a length of about 110 km; it is popularly known as the "Sea of Aragon". Special mention in the hydrography deserve the small Pyrenean mountain lakes called ibones. These lakes, of great scenic beauty, have their origin in the last glaciation and are usually found above 7003200000000000000♠2000 m.
The Autonomous Community belongs to three hydrographic confederations, the aforementioned Ebro, the Tagus (which is born in the Sierra de Albarracín range) and the Júcar which has as its main river in this community the Turia. Circo glaciar de Soaso, in the Ordesa Valley, of the Ordesa y Monte Perdido National Park. In Aragon, protected natural spaces are managed through the Red Natural de Aragón, an entity created in 2004 to protect all elements with ecological, landscape and cultural value and at the same time coordinate and establish common standards that contribute to their conservation and sustainable use. In this entity are integrated national parks, natural parks, nature reserves, biosphere reserves and other protected natural areas that have been declared by the autonomous community, the Ramsar Convention or the Natura 2000. Within the protected areas is the only national park of Aragon: the Ordesa y Monte Perdido National Park, the second national park created in Spain, in 1918, it is found in the Pyrenees in the comarca of Sobrarbe, occupies an area of 7008156080000000000♠15608 ha, apart of the 7008196790000000000♠19679 ha of the peripheral area of protection. At the moment it also enjoys other figures of Protection like the Biosphere Reserve of Ordesa-Viñamala and is cataloged as a World Heritage Site by UNESCO. In addition there are other 4 natural parks: the Moncayo Natural Park with an extension of 7008111440000000000♠11144 ha, the Sierra y Cañones de Guara Natural Park with 7008474530000000000♠47453 ha and 7008332860000000000♠33286 ha of peripheral area of protection, the Posets-Maladeta Natural Park with 7008334406000000000♠33440.6 ha and 7007592020000000000♠5920.2 ha of peripheral area of protection, and the Valles Occidentales Natural Park with 7008270730000000000♠27073 ha and 7007733500000000000♠7335 ha of peripheral area of protection. There are also three nature reserves, five natural monuments and three protected landscapes. Aragon, occupying the northeast of the Iberian Peninsula has served as a bridge between the Mediterranean Sea, the peninsular center and the coasts of the Cantabrian Sea. The human presence in the lands that today form the autonomous community date back several millennia, but the current Aragon, like many of the current historical nationalities, were formed during the Middle Ages. The oldest testimonies of human life in the lands that today make up Aragon go back to the time of the glaciations, in the Pleistocene, some 7005600000000000000♠600000 years ago. This population left the Acheulean industry that found its best weapons in the hand axes of flint or the cleavers of quartzite. In the Upper Palaeolithic appeared two new cultures: Solutrean and Magdalenian. The Epipaleolithic was centered in Lower Aragon, occupying the epoch between the 7th and the 5th millennium. In the first half of the 5th millennium BCE, Neolithic remains are found in the Huescan Outer Ranges and in Lower Aragon. The Eneolithic was characterized in the province of Huesca presenting two important megalithic nuclei: the Pre-Pyrenees of the Outer Ranges and the High Pyrenean valleys. The Late Bronze Age begins in Aragon around 1100 BCE with the arrival of the Urnfield culture. They are Indo-European people, with an alleged origin in Central Europe, who incinerate their dead by placing the ashes in a funeral urn. There are examples in the Cave del Moro of Olvena, the Masada del Ratón in Fraga, Palermo and the Cabezo de Monleón in Caspe. From the metallurgical point of view there seems to be a boom given the increase in foundry molds that are located in the populations. The Iron Age is the most important, since throughout the centuries it is the true substratum of the Aragonese historical population. The arrival of Central Europeans during the Bronze Age by Pyrenees until reaching the Lower Aragon area, supposed an important ethnic contribution that prepared the way to the invasions of Iron Age. The remains of the Roman walls of Zaragoza. Bust of Augustus found in Tarazona. The Mediterranean contributions represented a commercial activity that will constitute a powerful stimulus for the iron metallurgy, promoting the modernization of the tools and the indigenous armament, replacing the old bronze with the iron. There is presence of Phoenician, Greek and Etruscan products. In the 6th century BCE there are six groups with different social organization: products Vascones, Suessetani, Sedetani, Iacetani, Ilergetes and Citerior Celtiberians. They are Iberized groups with a tendency towards stability, fixing their habitat in durable populations, with dwellings that evolve towards more enduring and stable models. There are many examples in Aragon, among which Cabezo de Monleón in Caspe, Puntal of Fraga, Roquizal del Rullo or Loma de los Brunos. The type of social organization was based on the family group, consisting of four generations. Self-sufficient societies in which the greater part of the population was dedicated to agricultural and livestock activities. In the Iberian scope the power was monarchical, exercised by a king; there was a democratic assembly with participation of the male population. There were visible social differentiations and established legal-political statutes. The Romans arrived and progressed easily into the interior. In the territorial distribution that Rome made of Hispania, the current Aragon was included in the Hispania Citerior. In the year 197 BCE, Sempronius Tuditanus is the praetor of the Citerior and had to face a general uprising in their territories that ended with the Roman defeat and the own death of Tuditanus. In view of these facts the Senate sent the consul Marcus Porcius Cato with an army of 7004600000000000000♠60000 men. The indigenous peoples of the area were rebelling, except for the Ilergetes who negotiated peace with Cato. 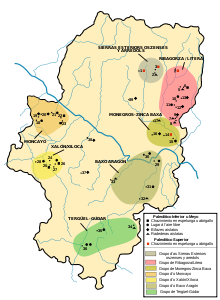 There were different uprisings of the Iberian peoples against the Romans, in 194 BCE sees a general uprising with elimination of half of the Roman army, in 188 BCE Manlius Acidinus Fulvianus, praetor of the Citerior, must confront in Calagurris (Calahorra) with the Celtiberians, in the 184 BCE Terentius Varro did it with the Suessetani, to those who took the capital, Corbio. In the 1st century BCE Aragon was the scene of the civil war to seize the power of Rome where the governor Quintus Sertorius made Osca (Huesca) the capital of all the territories controlled by them. Already in the 1st century BCE, the today Aragonese territory became part of the province Tarraconensis and there was the definitive romanization of it creating roads and consolidating ancient Celtiberian and Iberian cities such as Caesaraugusta (Zaragoza), Turiaso (Tarazona), Osca (Huesca) or Bilbilis (Calatayud). In the middle of the 3rd century the decay of the Roman Empire began. 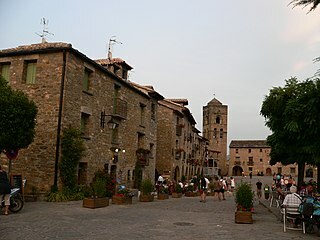 Between the years 264 and 266 the Franks and the Alemanni, two Germanic peoples who passed through the Pyrenees and came to Tarazona, which they sacked. In the agony of the Empire groups of bandits emerged who were dedicated to pillage. The Ebro Valley was ravaged in the 5th century by several gangs of evildoers called Bagaudae. The Aljafería, of the 11th century, was residence of the Banu Hud kings of the Taifa of Saraqusta. After the disintegration of the Western Roman Empire, the current area of Aragon was occupied by the Visigoths, forming the Visigothic Kingdom. In the year 714 the muslims conquered the central area of Aragon, converting to Islam the ancient Roman cities such as Saraqusta (Zaragoza) or Wasqa (Huesca). It was at this time that an important Muladi family was formed, the Banu Qasi (بنو قاسي), their domains were located in the Ebro Valley between the 8th and 10th centuries. After the disappearance of the Caliphate of Córdoba at the beginning of the 11th century, the Taifa of Zaragoza arose, one of the most important Taifas of Al-Andalus, leaving a great artistic, cultural and philosophical legacy. The name of Aragon is documented for the first time during the Early Middle Ages in the year 828, when the small County of Aragon of Frankish origin, would emerge between the rivers that bear its name, the Aragón river, and its brother the Aragón Subordán river. Castle of Loarre was built and expanded to serve as a frontier advance towards Muslim territories. It is one of the most important intact Romanesque castles in Europe. Royal Monastery of San Juan de la Peña. In its Royal Pantheon a good number of kings of Aragon and some kings of Navarre are buried. That County of Aragon would be linked to the Kingdom of Pamplona until 1035, and under its wing it would grow to form a dowry of García Sánchez III of Pamplona to the death of the king Sancho "the Great", in a period characterized by Muslim hegemony in almost the entire Iberian Peninsula. Under the reign of Ramiro I of Aragon would be extended borders with the annexation of the counties of Sobrarbe and Ribagorza (year 1044), after having incorporated populations of the historical comarca of Cinco Villas. In 1076, on the death of Sancho IV of Pamplona, Aragon incorporated part of the Navarrese kingdom into its territories while Castile did the same with the western area of the former domains of Sancho "the Great". During the reigns of Sancho Ramírez and Peter I of Aragon and Pamplona, the kingdom extended its borders to the south, established threatening fortresses on the capital of Zaragoza in El Castellar and Juslibol and took Huesca, which became the new capital. This leads to the reign of Alfonso I of Aragon that would conquer the flat lands of the middle Ebro Valley for Aragon: Ejea de los Caballeros, Valtierra , Calatayud, Tudela and Zaragoza, the capital of the Taifa of Saraqusta. At his death the nobles would choose his brother Ramiro II of Aragon, who left his religious life to assume the royal scepter and perpetuate the dynasty, which he achieved with the dynastic union of the House of Aragon with the owner of the County of Barcelona in 1137, year in which the union of both patrimonies would give rise to the Crown of Aragon and would add the forces that to its they would make the conquests of the Kingdom of Majorca and the Kingdom of Valencia possible. The Crown of Aragon would become the hegemonic power of the Mediterranean, controlling territories as important as Sicily, Corsica, Sardinia or Naples. According to Aragonese law, the monarch had to swear allegiance to the Kingdom's laws before being accepted as king. Like other Pyrenean and Basque realms, the Aragonese justice and decision making system was based on Pyrenean consuetudinary law, the King was considered primus inter pares ('first among equals') within the nobility. A nobleman with the title "Chustizia d'Aragón" acted as ombudsman and was responsible for ensuring that the King obeyed the Aragonese laws. An old saying goes, "en Aragón antes de Rey hubo Ley" ("in Aragon Law came before King"), similar to the saying in Navarre, "antes fueron Leyes que Reyes", with much the same meaning. We, who are worth as much as you we make you our King and Lord, as long as you keep our fueros and liberties, and if not, not. The Crown of Aragon in the middle of the 15th century. This situation would be repeated in the Commitment of Caspe (1412), which avoids a war that had dismembered the Crown of Aragon when a good handful of aspirants to the throne emerged after the death of Martin of Aragon a year after the death of his first-born, Martin I of Sicily. Ferdinand I of Aragon is the chosen one, of the Castilian House of Trastámara, but also directly connected with the Aragonese king Peter IV of Aragon, through his mother Eleanor of Aragon. Aragon is already a large-scale political entity: the Crown, the Cortes, the Deputation of the Kingdom and the Foral Law constitute its nature and its character. The marriage of Ferdinand II of Aragon with Isabella I of Castile, celebrated in 1469 in Valladolid, derived later in the union of the crowns of Aragon and Castile, creating the bases of the Modern State. The Early Modern Age was marked by increasing tension between the power of the Spanish Monarchy and those of the regions. The appointment of a Castilian as Viceroy in 1590, contrary to the agreement all Royal officials be Aragonese caused widespread unrest; when the Madrid authorities attempted to arrest the Aragonese writer and politician Antonio Perez in May 1591, it caused street violence in Zaragossa and a revolt known as the Alterations of Aragon. The unrest was largely confined to Zaragossa and quickly suppressed, with Perez going into exile. Philip then ordered a reduction in the proportion of taxes retained by the Generality of Aragon to lessen their capacity to raise an army against him. 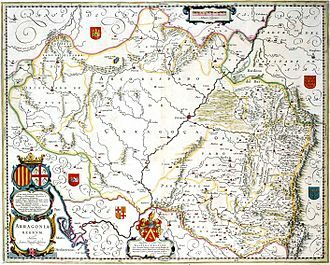 Aragonia Regnum, map of the Blaeu based on that of João Baptista Lavanha published circa 1640. The decay of independent institutions meant political activity focused instead on the preservation of Aragonese history, culture and art. The Archive of the Kingdom of Aragon preserved legal documents and records from the Justiciar and the Palace of Deputation or Parliament, unfortunately largely destroyed by the French in the battles of 1809. Debates on the causes of the 1590/91 revolt became a contest between opposing views of history that arguably persist in modern Spain. The new emphasis on Aragonese history led to the creation of the position of Chronicler or Historian of Aragon; its holders included Jerónimo Zurita y Castro, the De Argensola brothers, Bartolomé and Lupercio, Juan Costa and Jerónimo Martel. Much of the work produced by Aragonese writers challenged Philip II's version of events and were censored by the central government. In retaliation, the Generality of Aragon ordered the work of Castilian historian Antonio de Herrera y Tordesillas to be burned and commissioned Vicencio Blasco de Lanuza to write an alternative. His 'History of Aragon' was published in two volumes, 1616 and 1619 respectively; the urgency shows the importance placed on responding to Herrera. Other works commissioned at this time for the same purpose include a History of the Aragonese Deputation by Lorenzo Ibáñez de Aoiz and a detailed cartography of the Kingdom of Aragon by João Baptista Lavanha. In 1590/91, the Spanish monarchy was at the height of its strength but during the 17th century Spanish power declined for a number of reasons. Famine, disease and almost continuous warfare, largely in the Spanish Netherlands drained money, energy and men and weakened the economy; it is estimated the population of Spain fell nearly 25% between 1600-1700. War and economic decline inevitably led to increases in taxes, with predictable results; the refusal of the Catalan Cortes to contribute their share of the 1626 Union of Arms eventually led to a full-scale revolt in 1640. While Aragon itself remained relatively peaceful, it had to be treated with care by the Madrid government; during the reign of Charles II from 1665-1700, it provided his half-brother John of Austria with a power base in his battle for control of government with the Queen Regent Mariana of Austria. During the 1701-1714 War of the Spanish Succession, Aragon, Catalonia, Valencia and Majorca supported the Austrian claimant Charles. The victory of Philip V accelerated the trend towards greater centralisation; the Nueva Planta decrees of 1707 abolished the fueros and Aragonese political structures with their powers transferred to the Deputation of the Kingdom in Madrid; Aragon and Valencia were brought into the system in 1712, Catalonia and Majorca following in 1767. 1820 Emblem of the Political Government of Aragon under the Liberal Triennium (1820). The French invasion of 1808 that made Joseph Bonaparte King led to the outbreak of the Guerra de la Independencia Española or War of Independence in May. Zaragoza was largely destroyed in February 1809 during the Second Siege of Zaragoza, bringing a halt to its economic development. The 1812 Constitution proposed a number of reforms, including the creation of provincial territories and dividing Aragon into the four provinces of Calatayud, Teruel, Soria and Guadalajara. However, these reforms were delayed by Ferdinand VII's refusal to accept the constitution and finally implemented in 1822 during the 1820-23 Trienio Liberal. When Ferdinand was restored by French Bourbon forces in 1823, he abolished the Constitution along with the provincial reforms. When he died in 1833, the provincial division of 1833 divided Aragon into its current three provinces. 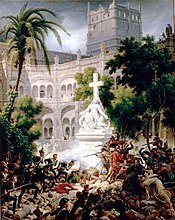 French troops storm the Abbey of Santa Engracia, February 1809, painted by Lejeune. Throughout the 19th century, Aragon was a stronghold of the Carlists, who offered to restore the fueros and other rights associated with the former Kingdom of Aragon. This period saw a massive exodus from the countryside into the larger cities of Aragon such as Huesca, Zaragoza, Teruel or Calatayud and other nearby regions, such as Catalonia or Madrid. The history of Aragon in the first half of the 20th century was similar to that of the rest of Spain; the building of infrastructure and reforms made by Miguel Primo de Rivera led to a brief economic boom, with new civil and individual liberties during the Second Spanish Republic. In June 1936, a draft Statute of Autonomy of Aragon was presented to the Cortes Generales but the outbreak of the Spanish Civil War prevented the development of this autonomist project. During the 1936-39 civil war, Aragon was divided between the two sides. The Eastern Area which was closer to Catalonia was run by the Republican Regional Defence Council of Aragon, while the larger or Western Area was controlled by the Nationalists. Some of the most important battles were fought in Aragon, including Belchite, Teruel and Ebro. After the defeat of the Republic in April 1939, Aragon and the rest of Spain was governed by the Francoist dictatorship. Belchite town, destroyed during the Battle of Belchite became a symbol of the Spanish Civil War. During the 1960s an exodus and a depopulation of the rural zones towards the industrial zones like the provincial capitals, other areas of Spain, besides other European countries was triggered. In 1964, one of the so-called Development Poles was created in Zaragoza. In the 1970s a period of transition as in the rest of the Country was experienced, after the extinction of the previous regime, with the recovery of democratic normality and the creation of a new constitutional framework. It began to demand an own political autonomy, for the Aragonese historical territory; sentiment that was reflected in the historic manifestation of April 23 of 1978 that brought together more than 7005100000000000000♠100000 aragoneses through the streets of Zaragoza. Not having plebiscited, in the past, affirmatively a draft Statute of autonomy (second transitory provision of the constitution) and not making use of the difficult access to autonomy by Article 151 whose aggravated procedure required, apart from the initiative of the process autonomic follow the steps of article 143, which was ratified by three quarters of the municipalities of each of the affected provinces that represent at least the majority of the electoral census, and that this initiative was approved by referendum by the affirmative vote of the majority absolute of the electors of each province, Aragon acceded to the self-government by the slow way of article 143 obtaining lower competence top, and less self-management of resources, during more than 20 years. The August 10 of 1982, was approved by the Cortes Generales the Aragon's autonomy statute, signed by the then president of the Government, Leopoldo Calvo-Sotelo, and sanctioned by His Majesty Juan Carlos I of Spain. The May 7 of 1992 a Special Commission of the Aragonese Corts, elaborated a reformed text that was approved by the Aragonese Corts and by the Spanish Cortes. Again, a small statutory reform in the year 1996 extended the competence framework, forcing a definitive comprehensive review for several years, a new statutory text was approved in 2007, by majority but without reaching total unanimity. In the 1990s the Aragonese society increases a significant qualitative step in the quality of life due to the economic progress of the State at all levels. At the beginning of the 21st century, a significant increase in infrastructures was established, such as the arrival of the High Speed Train (AVE), the construction of the new dual carriageway Somport-Sagunto and the promotion of the two airports in the Autonomous Community, Zaragoza and Huesca-Pirineos. At the same time, large technological projects are being undertaken, such as the Walqa Technology Park and the implementation of a telematic network throughout the community. General view of the Expo 2008 from the Torre del Agua. In 2007 the Statute of Autonomy of Aragon was reformed again -which was approved by a broad consensus in the Aragonese Corts, having the support of the PSOE, the PP, the PAR and the IU, whereas CHA abstained- granting the Autonomous Community the recognition of historical nationality (since the Organic Law of 1996 reform of the statute, it had the condition of nationality), includes a new title on the Administration of Chustizia and another on the rights and duties of the Aragoneses and guiding principles of public policies, the possibility of creating an own tax agency in collaboration with that of the State, and also the obligation to public authorities to ensure to avoid transfers from watersheds such as transfer of the Ebro, among many other modifications of the Statute of Autonomy. The designation of Zaragoza as the venue for the 2008 International Exhibition, whose thematic axis was Water and Sustainable development, represented a series of changes and accelerated growth for the autonomous community. In addition, two anniversaries were celebrated that same year, the bicentennial of Sieges of Zaragoza of the War of Independence against the Napoleonic invasion, occurred in 1808 and the centenary of the Hispano-French Exposition of 1908 that it supposed as a modern event, to demonstrate the cultural and economic thrust of Aragon and at the same time serve to strengthen ties and staunch wounds with the French neighbors after the events of the Napoleonic Wars of the previous century. As of 2015[update], half of Aragon's population, 50.45%, live in the capital city of Zaragoza. Huesca is the only other city in the region with a population greater than 7004500000000000000♠50000. The majority of Aragonese citizens, 71.8%, live in the province of Zaragoza. 17.1% live in the province of Huesca, and 11.1% in the province of Teruel. The population density of the region is the second lowest in Spain after Castilla-La Mancha: only 26.8/km². The most densely populated areas are around the valley of the river Ebro, particularly around Zaragoza, and in the Pyrenean foothills, while the areas with the fewest inhabitants tend to be those that are higher up in the Pyrenean mountains, and in most of the southern province of Teruel. Only four cities have a population of more than 7004200000000000000♠20000: Zaragoza 7005700000000000000♠700000, Huesca 7004500000000000000♠50000, Teruel 7004350000000000000♠35000, and Calatayud 7004200000000000000♠20000. The well-developed irrigation system around the Ebro has greatly supported the productive agriculture. The most important crops include wheat, barley, rye, fruit and grapes. Livestock-breeding is essential especially in the northern areas, where the lush meadows provide excellent conditions for sheep and cattle. The main livestock are cattle, 7005334600000000000♠334600; sheep, 7006286210000000000♠2862100; pigs, 7006367000000000000♠3670000; goats, 7004780000000000000♠78000; and poultry, 7007205450000000000♠20545000. The chief industrial centre is the capital Zaragoza, where the largest factories are located. The largest plant is the Opel automotive plant with 7003873000000000000♠8730 employees and production of 7005200000000000000♠200000 per year. It supports many related industries in the area. Other large plants in the city include factories for trains and household appliances. Mining of iron ore and coal is developed to the south, near Ojos Negros. Electricity production is concentrated to the north where numerous hydro power plants are located along the Pyrenean rivers and in the 7009115000000000000♠1150 MW Teruel Power Plant. There is an aluminium refinery in the town of Sabiñánigo. The main centres of electronics industry are Zaragoza, Huesca and Benabarre. Chemical industry is developed in Zaragoza, Sabiñánigo, Monzón, Teruel, Ojos Negros, Fraga, Benabarre and others. The transport infrastructure has been greatly improved. There are more than[data missing] of motorways which run from Zaragoza to Madrid, Teruel, Basque country, Huesca and Barcelona. The condition of the other roads is also good. As of 2016[update] there are 7005899008000000000♠899008 cars in Aragon. Through the territory of the province runs the new high-speed railway between Madrid and Barcelona with siding from Zaragoza to Huesca, which is going to be continued to the French border. There is an International Airport at Zaragoza, as well as several smaller airports at Huesca, Caudé, Santa Cilia de Jaca and Villanueva de Gállego. The unemployment rate stood at 11.6% in 2017 and was lower than the national average. On 21 April 2006, regional television broadcasts in Aragon officially began with the launch of Aragón TV. The law which established the CARTV (Aragon Corporation Radio and Television) dated from 1987, but various political disputes delayed the project for several legislatures. During the years that Aragon had no public television, several media groups sought to supplement their absence. For one TVE-Aragon, taking the Territorial Centre in Zaragoza, produced several programs and educational activities with the Aragonese town. As for private groups, there were several projects. The most widely accepted for many years had been Antena Aragón, which came to be regarded as regional television. This channel was created in 1998 and disappeared in 2005 shortly after having to leave the Media Production Centre (CPA), as this was built by the DGA for future public television host Aragon. With the push for the creation of public television, Antena Aragón merged with RTVA (Radio Television Aragonesa) belonging to the Herald Group. Merging RTVA Antena Aragón and led to channel ZTV (Zaragoza Television). Moreover, Antena 3 Televisión aired for several years, and off to Aragon, a news report fully Aragonese, having a central issue in the Pinares de Venecia in Zaragoza, within the premises of the Theme Park of Zaragoza. Aragon Radio, began broadcasting on 18 August 2005 at 5PM with the sound of drums and drums of Calanda and a group song Zaragoza "The Fish". Estimates of its audience range from 20 000 listeners, according to the latest EMG, to 7004700000000000000♠70000, according to private findings. The channel has regional news bulletins every hour from 7AM to midnight and coverage of sports. Nowadays SD Huesca is the best team in Aragon because it is the only team of the region in La Liga (Football First Division), reaching this achievement for the first time in its history in the season 2017/2018. La Romareda, home ground of Real Zaragoza. However, Aragon's most successful football club ever is Real Zaragoza. The club was founded in 1932 and spent 58 seasons in First DIvision, having played at its current ground, La Romareda, since 1957. Real Zaragoza have won six Copa del Rey titles from 1964 to 2004, and the 1995 European Cup Winners' Cup. There are plenty of smaller clubs in the region, like CD Teruel. King Ferdinand II of Aragon. 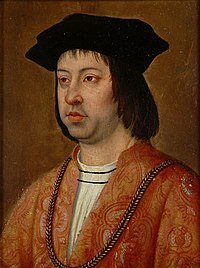 King Ferdinand II of Aragon (1452–1516) married queen Isabella I of Castile and united the Crown of Aragon with the Crown of Castile, giving form to the actual Spain. Michael Servetus (1509/11–1552) was a theologian and physician who received numerous charges of heresy by both Catholics and Protestants and was burnt at the stake in Calvin's Geneva during the 16th century. Baltasar Gracián (1601–1658) writer of Spanish Baroque literature. Rocque Joaquin de Alcubierre (1702–1780) was a military engineer who discovered the ruins of Pompeii. ^ "LEY 10/2009, de 22 de diciembre, de uso, protección y promoción de las lenguas propias de Aragón" (PDF). Archived from the original on 28 March 2010. Retrieved 2010-04-29. ^ a b c d "Aragon Basic Data, 2017" (PDF). aragon.es. Archived (PDF) from the original on 2018-03-17. Retrieved 2018-03-18. ^ jiriarte (2010-07-16). "Aragon". ec.europa.eu. Retrieved 2018-03-17. ^ "PIB de las Comunidades Autónomas" [GDP of the Autonomous Communities]. datosmacro.com (in Spanish). Retrieved 30 December 2015. ^ "folleto_guara_fr_en.pdf" (PDF). Sierra de Guara. 2018-03-17. Archived from the original (PDF) on 2018-03-17. Retrieved 2018-03-17. ^ José María Cuadrat Prats, "El clima de Aragón", in J. L. Peña, L. A. Longares and M. Sánchez (editions), Geografía Física de Aragón. Aspectos generales y temáticos, Zaragoza, University of Zaragoza and Fernando el Católico Institution, pp. 15-26. 2004. ^ "Red Natural de Aragón". Government of Aragón (in Spanish). Archived from the original on 24 December 2011. Retrieved 14 March 2019. ^ "Parque Nacional de Ordesa y Monte Perdido". Government of Aragon (in Spanish). Archived from the original on 22 December 2011. Retrieved 14 March 2019. ^ "Red de Espacios Naturales Protegidos". 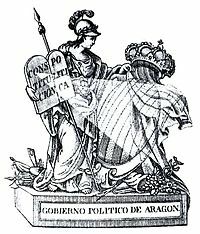 Government of Aragon (in Spanish). Archived from the original on 21 December 2011. Retrieved 14 March 2019. ^ "El Justicia de Aragón". Eljusticiadearagon.com. 2007-02-27. Retrieved 2012-06-04. ^ Zagorin, Perez (1982). Rebels and Rulers, 1500-1660: Volume 2, Provincial Rebellion. Cambridge University Press. pp. 32–33. ISBN 052128712X. ^ Pérez Gascón, Jesús. "The Aragonese Rebellion of 1591". Academia.edu. Retrieved 8 April 2018. ^ Storrs, Christopher. [gale.cengage.co.uk/images/SpainChristopherStorrs.pdf "The Decline of Spain in the Seventeenth Century"] Check |url= value (help) (PDF). State Papers Online. Gale;Cengage Learning. Retrieved 7 April 2018. ^ Zagorin, Perez (1982). Rebels and Rulers, 1500-1660: Volume 2, Provincial Rebellion. Cambridge University Press. pp. 34–37. ISBN 052128712X. ^ Vives Vi, Jaime (1969). An Economic History of Spain. Princeton University Press. p. 591. ISBN 0691051658. Retrieved 8 April 2018. ^ State Agency Official State Gazette (December 31, 1996). "Organic Law 5/1996, of December 30, of Reform of the Organic Law 8/1982, of August 10, of the Statute of Autonomy of Aragon, modified by the Organic Law 6/1994, of March 24, of reform of said Statute". Documento BOE-A-1996-29115. Retrieved February 17, 2015. ^ "Cifras completas". Archived from the original on 2007-02-03. ^ Alberto Turón Lanuza. "El Web de la Música Tradicional Aragonesa". Arafolk. Archived from the original on 2012-06-21. Retrieved 2012-06-04. ^ "Carnabal de la Balle de Bielsa". Carnaval de Bielsa. Retrieved 2012-06-04. ^ "Gobierno de Aragón". Portal.aragob.es. Archived from the original on 2009-08-13. Retrieved 2010-04-26. ^ "Cuadro resumen de Grupos Parlamentarios". Senado de España (in Spanish). Retrieved 14 March 2019. ^ "Barómetro de Opinión de Invierno 2011". Aragón Hoy (in Spanish). Dirección de Comunicación del Gobierno de Aragón. 30 March 2011. Retrieved 14 March 2019. ^ Tejedor Carnicero, José Vicente (2 May 2018). "Spain - List of Cup Finals". Rec.Sport.Soccer Statistics Foundation. Retrieved 14 March 2019. ^ "Season start Aragón – Ski season opening Aragón". Ski Resort. Skiresort Service International GmbH. Archived from the original on 12 January 2014. Retrieved 14 March 2019. ^ "Jaca to bid for 2014 Winter Games". CNN International. CNN. 21 July 2005. Retrieved 14 March 2019. ^ "Juegos Olímpicos Zaragoza Pirineos 2022 « Candidatura a los JJOO de Invierno de 2022 (No Oficial)" (in Spanish). Archived from the original on June 15, 2013. Retrieved 14 March 2019. ^ "Adhesión a Candidatura Zaragoza Pirineos 2022". Ayuntamiento de Zaragoza (in Spanish). Archived from the original on January 12, 2014. Retrieved 14 March 2019. ^ "Barcelona is now Spain's sole candidate for the 2022 Winter Olympics". Ajuntament de Barcelona. 7 November 2011. Archived from the original on January 11, 2014. Retrieved 14 March 2019. Lavanha, João Baptista; Cartography of the Kingdom of Aragon; published 1611. 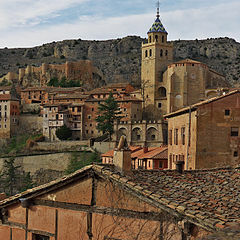 Wikivoyage has a travel guide for Aragon. Wikimedia Commons has media related to Aragon. "Aragon" . Encyclopædia Britannica. 2 (11th ed.). 1911. pp. 313–314.